Bremer’s monument, on the Louis Mentor Boardwalk. Bremerton is a city rich in history. I wanted to create a single post that would cover its most pivotal events. I intend this synopsis to be a living post; that is, I offer anyone a chance to offer his or her two cents on how it could be made better — and most importantly to me, more accurate. Please share it with your friends and neighbors. We’re all in this together. Pre-World War II photo of Bremerton, courtesy of Evergreen Upholstery. Bremerton’s beginnings can be traced in large part to two men: Ambrose Wyckoff and William Bremer. Wyckoff, a Navy lieutenant, came to Seattle in 1877 to conduct a surveying mission. The man who would become known as “That Puget Sounder” made his case to Congress for a shipyard in Sinclair Inlet, and eventually, he got his way. Congress appropriated $10,000 in 1891 and the 145-acre Puget Sound Naval Yard was born. Bremer, a German immigrant and Henry Paul Hensel, a jeweler, saw opportunity in Wyckoff’s purchase. They bought up the land, sold some of it to the Navy at $50 an acre and ultimately developed the beginnings of Bremerton. The shipyard sputtered at first during a nationwide depression but got rolling after Wyckoff and others worked to get another $1.5 million from Congress by 1901, when the city was officially incorporated. The same year, nearby Charleston established a post office, the beginnings of a bustling commercial district there. The postmaster, who also owned a mill near what is now Evergreen-Rotary Park, started burning refuse from the mill in what became the city’s first source of electricity. Bremerton has been known for its rowdy bars through the years, but its earliest era may well have been the roughest. By 1903, the town had 16 saloons in a city of only 1,200 people. The Navy threatened to leave Sinclair Inlet until Alvin Croxton, the town’s first mayor, did something about it: he led the charge to close them all. Even before Bremerton, a community was building around a mill on the shores just north of present-day Manette. William Renton established a saw mill in 1854 at Enetai Point, but it burned down 16 years later, after Renton sold it and established a mill at Port Blakely on Bainbridge Island. Still, a town grew there and in neighboring Tracyton. In 1916, a ferry was established between Bremerton and Manette. Two years later, Manette was incorporated into the city, and Charleston followed in 1927. What was created was a city on two peninsulas, finally linked by the Manette Bridge in 1930. The iconic shipyard crane was installed in 1933. As it has throughout history, Bremerton has ebbed and flowed like the tides with the country’s war efforts. Following the first world war, the city started to languish until its biggest boom of all came with the second. The population here exploded from 15,000 to 85,000, as Westpark, Eastpark and Sheridan Park were built in an effort to provide enough housing. An African American population grew as well, but was confined to Sinclair Park in what is now the West Hills until residents like Lillian Walker fought against the de facto segregation. Barrage balloons surrounded the city in case of an attack by Japanese warplanes, blackouts were held and “victory gardens” became popular. Women working in the shipyard gave rise to the cultural icon “Rosie the Riveter.” Even after the war, it was allegedly a local resident who told President Harry Truman to “Give ’em hell,” while at a speech at Fifth and Pacific. 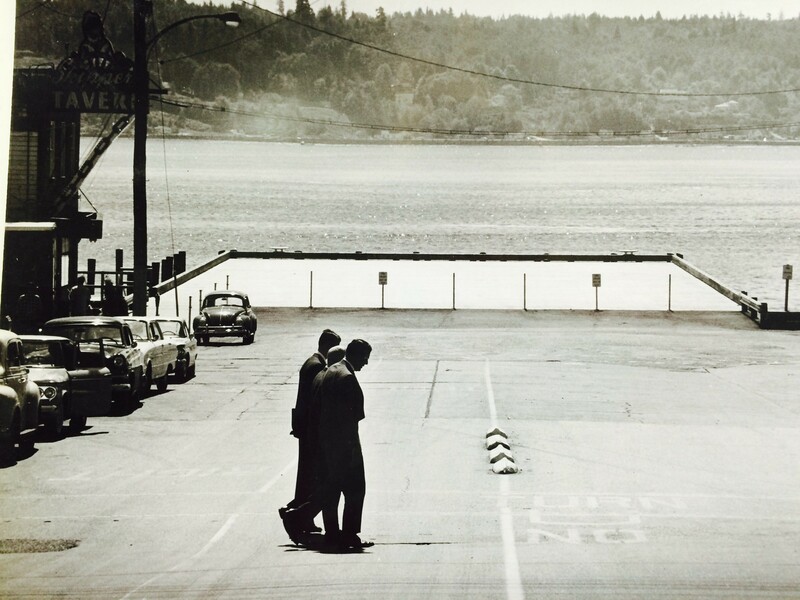 The post-war years saw Bremerton decline from its war boom but maintain its status as Kitsap County’s commercial hub. Olympic College was created by the Bremerton School District in 1946, and was eventually taken over by the state. The Casad Dam, named for the visionary head of Bremerton public works was completed in 1957, and its Union River headwaters still provide the city’s water supply today. 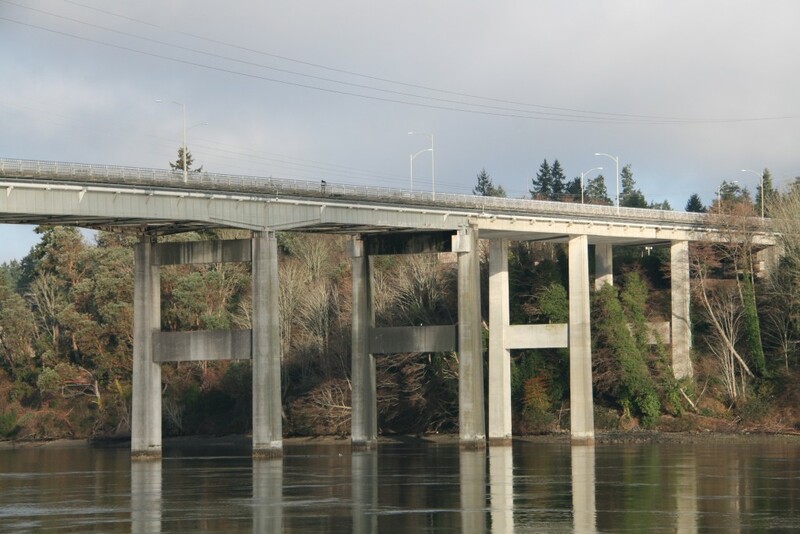 The Warren Avenue Bridge was completed in 1958, offering a second link to East Bremerton. Then came an exodus toward more rural parts of Kitsap County. The federal government chose to build a new submarine base at Bangor in 1973. Suburban life grew in other parts of the county, and developers started eyeing locations outside Bremerton for shopping malls. Ed Bremer, last surviving member of the founding family, attempted to keep Bremerton as the commercial center of the county. But his efforts would backfire: Ron Ross, developer of the Kitsap Mall, sued successfully and won a $2 million judgement for impeding an attempt by Ross to build a mall near Wheaton Way and Riddell Road. Bremerton’s end as the county’s retail hub more or less officially came on Aug. 1, 1985, the day Kitsap Mall opened in Silverdale. Ed Bremer died about a year later. His fortunes went to the Bremer Trust, which now benefits Olympic College but still maintains a portfolio of Bremerton properties. 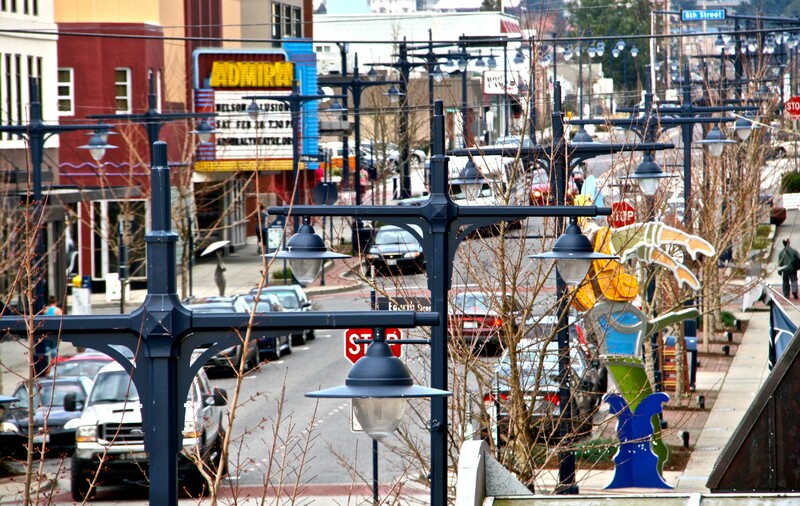 Efforts in the 1990s to restore Bremerton’s downtown were hit-and-miss. There were victories, including the restoration of the Admiral Theater and the construction of the new Bremerton Transportation Center. But gang violence and high crime still plagued the city, and in 1998, the city lost the famed World War II Naval ship USS Missouri to Hawaii as a museum. 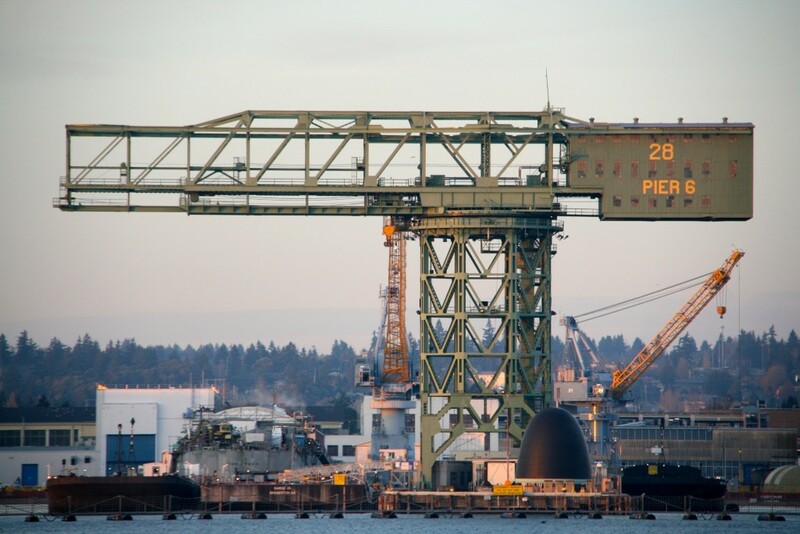 Bremerton’s beginning to the 21st century has seen its own set of victories and setbacks. Under Mayor Cary Bozeman, the city embarked on a vigorous downtown revitalization effort, branding it the “Harborside,” and developing controversial condominiums, conference center and fountain park. Many other city parks have been redeveloped, the old Westpark housing area was demolished and violent crime has plummeted. A tunnel funneled traffic out of downtown, a new Manette Bridge replaced the old span and a 10-screen movieplex was built. But Harrison Medical Center, with roots here dating back to the early 20th century, announced plans recently to vacate most of its East Bremerton campus for Silverdale. A spate of downtown apartment projects aims to bring even more people into living an urban lifestyle in downtown Bremerton. Special thanks to so many in helping me to put this together, including Kitsap Sun’s archives, historians Frank Wetzel, Fredi Perry Pargeter, Russell Warren and Ruth Reese, The Kitsap Historical Society and Museum and its staff, the book “Manette Pioneering,” historylink.org and others. Great idea. Keep expanding and updating this. I learned something very interesting in your opening paragraph. I had not realized William Bremer had a partner when he bought the Williams farm. Henry Hensel’s name struck a chord with me. I have been researching and writing a book on Joseph Mayer, Seattle street clock maker and manufacturing jeweler. This grew out of my involvement with the restoration of Bremerton’s two street clocks–both made by Mayer and installed in 1928. I have been researching Seattle and Bremerton’s first jewelers as a part of understanding Joseph Mayer. This has included collecting watches with jeweler’s names on the dial and/or movement. I have one (ca 1905) with H. Hensel Seattle, Wash. on the dial. Fredi Perry covered Hensel’s relationship with Bremer in Kitsap County Historical Society’s Kitsap County, A History p. 248. He was Bremer’s brother in law. Hensel was born in Wisconsin in 1870 to German immigrants. His father was a blacksmith. They moved to Aberdeen, SD where they met William Bremer, another German immigrant. Both the Hensel’s and Bremer moved to Seattle in 1888. Henry’s father, William was a successful blacksmith and wagon maker in Seattle. Bremer (28) married Hensel’s 18 year old sister Sophie in the spring of 1891. Bremer and Hensel (21) purchased the Williams farm in the fall of 1891. The families were enthusiastic sailors and campers. Henry Hensel was active in the Seattle Yacht Club and helped form the Elliott Bay Yacht Club, serving as Commodore of both. Henry and his younger brother Lewis both trained as watchmakers and jewelers. Henry established a manufacturing and wholesale jewelry business in 1894 and Lewis a retail business in 1896. Henry was in business until 1929. He retired and moved to Agate Point on Bainbridge Island in 1933. Both he and his brother, Lewis passed away in 1935. Fascinating, Paul! I am very excited for your book on Mayer. Just a few 1st notes, Ross had nothing to do with Kitsap Mall. Maybe you were thinking about the Central Kitsap Mall across the street, about 1972. Photo of the dock is 1st street not 2nd. Mid 70’s is about correct for the photo as before that, the dock was open to traffic, closed in the photo. Photo is Ed Bremer, John was dead. Is that Willard? Good points, Dan. Thank you for your contributions! I believe I live in what’s called Sheridan Park, but I was never sure what that meant, aside from the name of the street and the Parks Department building. My mother lived in this neighborhood too, but she didn’t refer to it by that name. Did the names Eastpark, Westpark, and Sheridan Park only arise in reference to the WWII housing projects? Thanks for doing this fascinating work. Thanks, Suzanne! I think they are indeed in reference to those WWII projects. But I may be able to find out the story behind the name Sheridan. I’ll do some digging and get back to you. Ed Bremer was very hands-off [clueless] as to the goings-on in Bremerton. Henry Millander, then-president of Olympic College and de facto ruler of the Bremer trust, was the obstinate puppet-master behind driving all the developers to Silverdale in a misguided attempt to preserve Bremerton’s downtown core as THE retail center of the county.